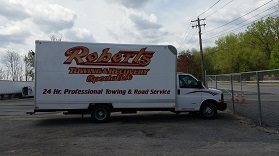 Here at Roberts Towing and Recovery although we do offer 24/7 Towing and Road service Services. Our Offices are only open Monday-Friday from 8 A.M. to 4 P.M. Our after hours phone number and our daytime phone number do remain the same. 518-432-4097. Robert’s Towing is a professional towing, road service and transportation company that operates 24 hours a day, 7 days a week. We are capable of towing anything from cars and motorcycles to tractor trailers, heavy equipment, tankers and more. We provide service for law enforcement agencies along with national and local companies in the power, environmental and construction equipment industries. We are contracted with multiple local and state law enforcement agencies including the City of Albany, town of Bethlehem, New York State Police, and Albany and Rensselear County sheriff’s offices for car and truck rollovers, winch outs and more. In order to serve a larger area and offer a wider variety of services, we operate three companies at two different locations. 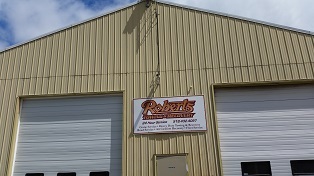 Robert’s Towing in Albany NY is your headquarters for fast, reliable towing and recovery work around the clock. AB’s Road Service, also located in Albany, provides fast 24 hour roadside repair including tire changes, mechanical work, electrical work, air brake service, hydraulics, suspension, limited welding and more. The Wilton Truck Center, our northern facility, is located at the truck stop off the Adirondack Northway at I-87 Exit 16. Wilton provides top notch towing, 24 hour road service and expert truck repair both in and out of the shop. New to our repair shop we now offer full computer tire balancing and computer alignments for any size truck or trailer. We also offer full on the road and in our shop computer diagnostics for all types of trucks. We can do many things for example forced regens and can monitor DPF systems. Error: Error validating access token: Session has expired on Sunday, 21-Oct-18 07:10:47 PDT. The current time is Thursday, 18-Apr-19 08:25:50 PDT. Specialty recovery of vehicles where no truck can reach using our specialized track machine. © 2019 Roberts Towing All rights reserved.